You are here: Home » A Very Happy Passover to You! 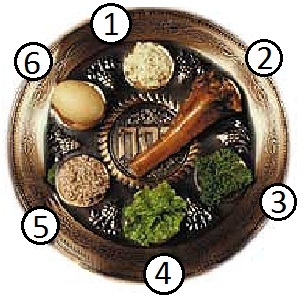 A Very Happy Passover to You! 1. Maror – bitter herbs; generally horseradish is used. 2. Zeroa – shank bone; generally a lamb shank. 3. Karpas – a vegetable; generally, parsley is used here. 4. Chazeret – a bitter vegetable; here, lettuce is shown. Many people choose to put a dish of salt water in its place. 5. Charoset – mixture of apples, nuts, wine and spices. 6. Baytzah – hard-boiled egg. After tonight’s Seder (the service in which the story of the liberation of the Israelites from slavery in ancient Egypt is told and celebrated), the meal can begin, so here’s where you come in… what to make? Even with such dietary restrictions as “no bread or pasta”, you can never go wrong with a nice brisket, or even a roasted chicken. If you are in need of some culinary inspiration, just take a trip to Bon Appétit, and check out their Passover Favorites Slideshow. It made me hungry just looking at it!